I was planning on writing today about how once again Monday got away from me. It seems like anytime I have a fabulous, fun, and relaxing weekend, in this case continuing Chris’ birthday celebration with a West End performance of The Book of Mormon and drinks with friends, it’s so hard to get back into my routine and by Monday afternoon my “to do” list is a mile long and growing. But now I feel like complaining about a Monday riddled with extra chores and work seems asinine. I try to stay lighthearted on this blog, while still being as real as possible. None of you want to hear about, boohoo, I’m homesick and haven’t adjusted to living here in London. Cry me a river. But the fact is sometimes I miss where I come from. I hate the five hour (minimum) time difference between us and our friends; I hate waiting until an appropriate hour to call family to check in; I hate not being able to give my friends a celebratory hug or console them with a glass of wine; and worst of all I hate the distance you can physically feel when tragedy strikes. So I am instead heading into my Tuesday missing my friends and family deeply. In light of the horrific events at yesterday’s Boston Marathon, I just want to tell my loved ones that I miss them. My people are fine and I hope yours are too. Food brings us together. Even when we are an ocean apart, flavors can transcend. I often use food to celebrate not only with family and friends but the people themselves through their traditions, favorite flavors, and techniques. During college, I had the pleasure of sharing an apartment and a kitchen with my friend, Zandy. Together we cooked up some fantastic meals and I learned some amazing simple tricks from her about the ease of magnificent Italian cooking. 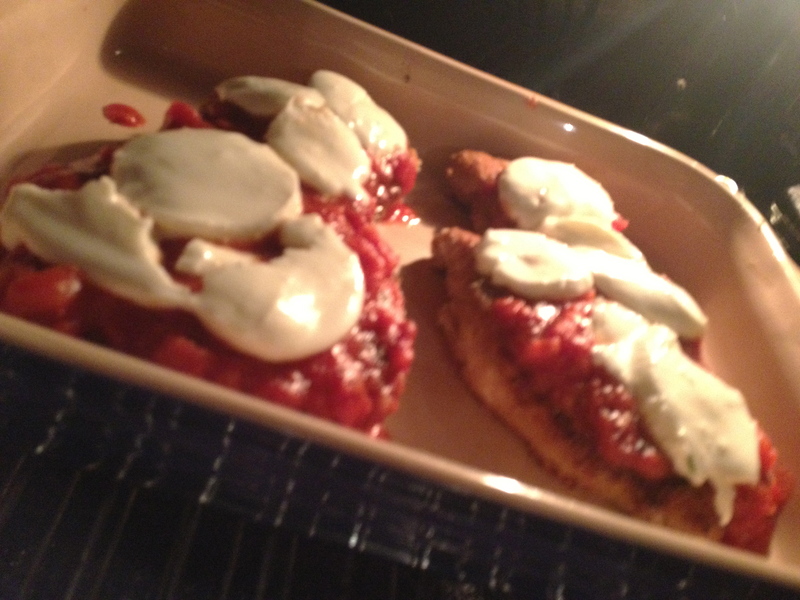 One of the best lessons I learned was the key to a super crispy, extra crusty, and very flavorful Chicken Parmesan. The trick is to double dip!! Mix together the egg and a splash of water in one dish, then Parmesan, breadcrumbs, and seasoning in another. Then dip your pounded chicken into the eggs… then the breadcrumbs… then back in the eggs… and one more time into the breadcrumbs. This is the technique to getting a perfect coating. 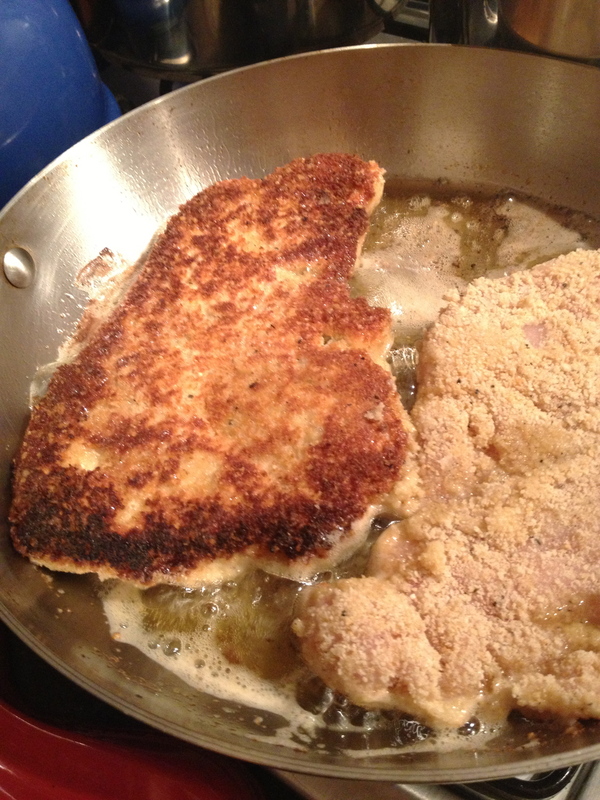 Then fry the chicken breasts in a shallow pan of olive oil until perfectly browned on each side. Top with a scoop of homemade tomato sauce and really good fresh mozzarella. Bake for about 10 minutes, until the cheese is melted and the chicken cooked through. If you want an extra bubble on your cheese, feel free to turn on the broiler for a minute at the end. 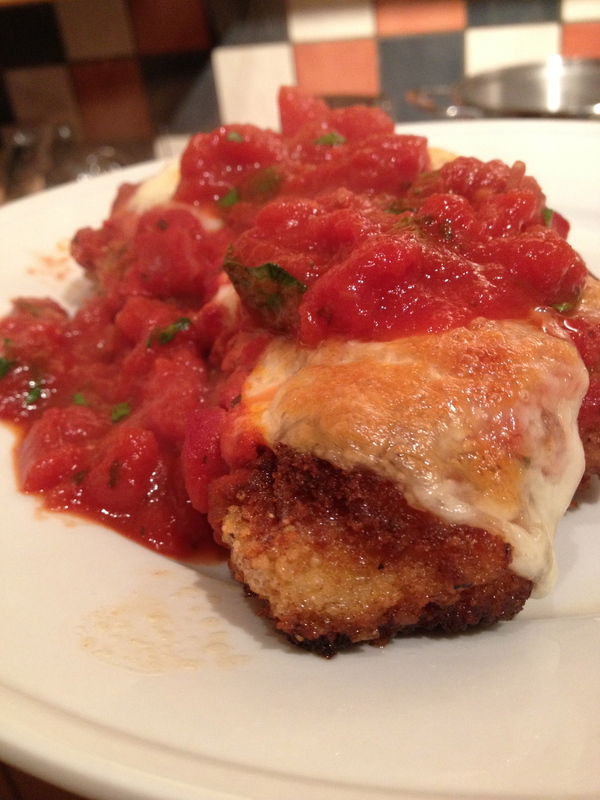 I love to serve chicken parmesan with lots of tomato sauce loaded with fresh basil. 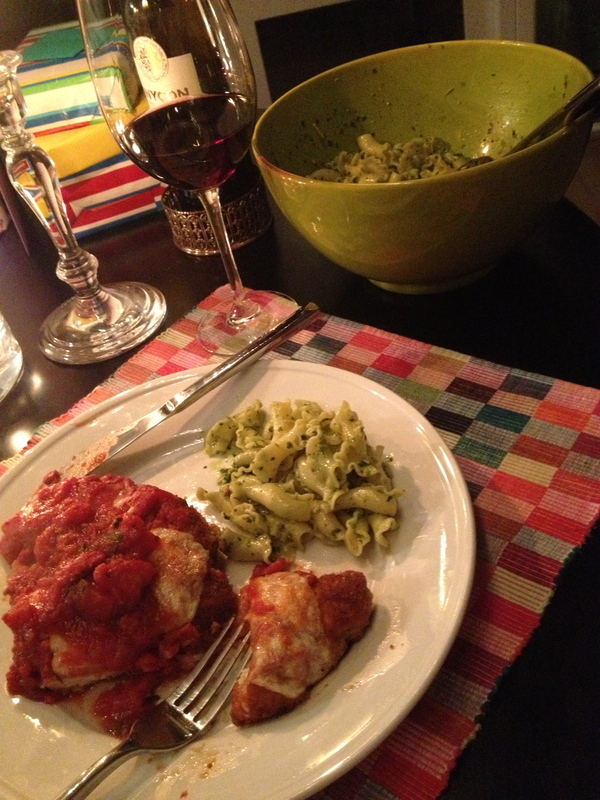 For Chris’ birthday, I served the chicken parm with a fresh pesto pasta for added basil flavor. It was so yummy I couldn’t wait to take a bite!! Pound the chicken breasts to an even 1/2 inch thickness. Season with salt and pepper. In a shallow bowl or breading pan, beat the egg with 2 tablespoons of water. 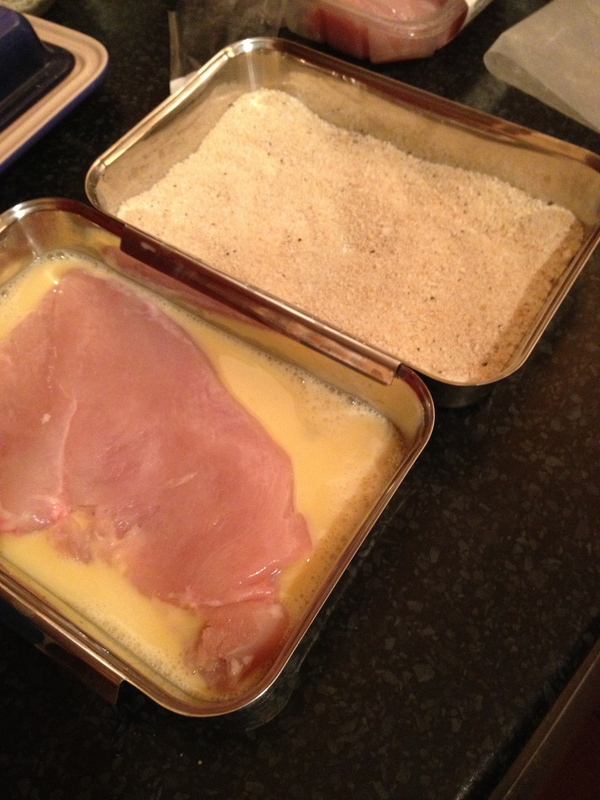 In another, mix together the breadcrumbs, parmesan, italian seasoning, salt, and pepper. Dredge the chicken into the egg, then the breadcrumb mixture, then back into the egg and a second time into the breadcrumbs. This will evenly and well coat the chicken. In a large skillet, heat the olive oil over medium high heat. Test to see that the oil is hot enough by dropping a breadcrumb into the oil. It should sizzle but not burn. Once the pan is hot enough, add the chicken breasts. Cook until brown on each side, about 3-4 minutes per side. Remove and place onto a baking dish. 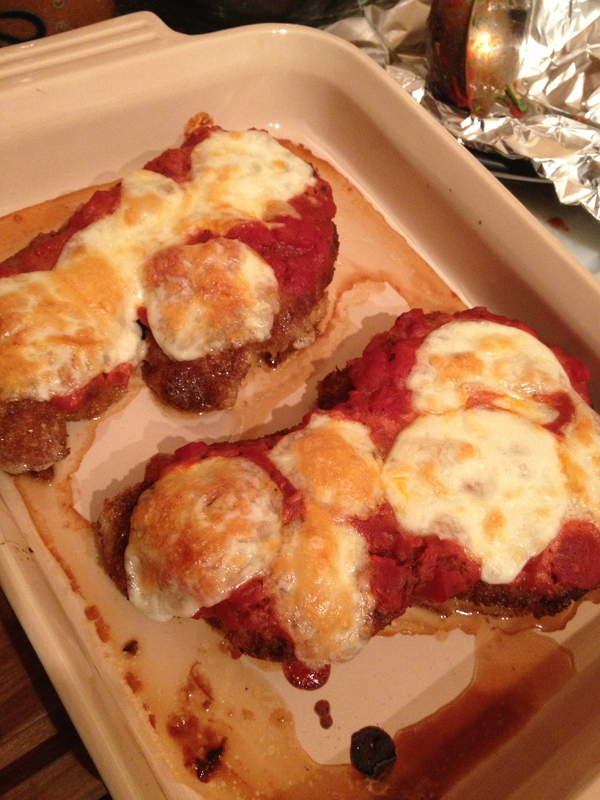 Spreas about 1/3 cup of tomato sauce onto each breast and then cover with mozzarella slices. Bake in the oven for 10 minutes, until the cheese is melted and bubbly. Serve with grated parmesan and more tomato sauce. In a sauce pan, heat olive oil over medium heat and sauté the shallots for 3 minutes. Add garlic and continue to cook for 2 minutes. Add red wine and reduce. Stir in the tomatoes in their juices. Add the pasta sprinkle, season with salt and pepper, and simmer for at least 15 minutes.